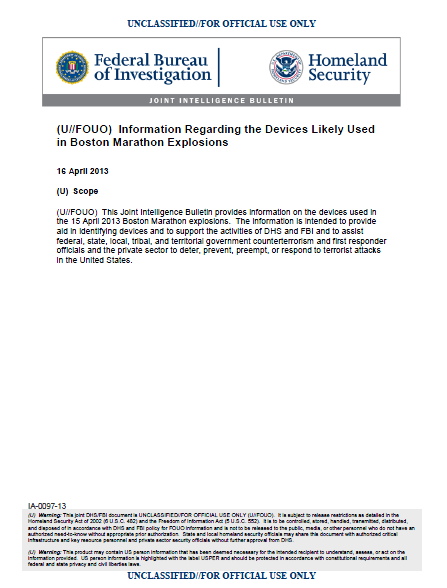 (U//FOUO) This Joint Intelligence Bulletin provides information on the devices used in the 15 April 2013 Boston Marathon explosions. The information is intended to provide aid in identifying devices and to support the activities of DHS and FBI and to assist federal, state, local, tribal, and territorial government counterterrorism and first responder officials and the private sector to deter, prevent, preempt, or respond to terrorist attacks in the United States. (U) On 15 April 2013, at approximately 2:50 p.m., two explosions occurred in quick succession near the finish line of the Boston Marathon, killing at least three people and causing numerous injuries. Preliminary findings reveal the two devices were located less than a block apart, and functioned within approximately 10-15 seconds of each other. Both devices were concealed in backpacks and placed where spectators were gathered. (U//FOUO) Based on preliminary examination of photographs and on-scene reports, one improvised explosive device (IED) consisted of a pressure cooker concealed in a backpack with an as of yet determined main charge (possibly a low explosive) and improvised fragmentation, possibly including nails, BBs, and ball bearings. The other device was also housed in a metal container, but currently there is insufficient evidence to determine if it was also a pressure cooker. The fuzing system and method of initiation for the two devices are unknown at this time. (U//FOUO) Further post-blast analysis and chemical analysis is necessary to confirm the presence of these components and the identity of the main charge explosive. Collection of evidence is ongoing and forensic and technical analysis will be forthcoming. — (U//FOUO) One of three devices used in the 1 May 2010 attack in Times Square incorporated a pressure cooker containing approximately 120 firecrackers. — (U//FOUO) On 24 May 2012, PFC Naser Jason Abdo was convicted of attempted use of a weapon of mass destruction and, on 10 August 2012, was sentenced to two consecutive sentences of life in prison, plus 60 years. He was in possession of bomb-making components, including two pressure cookers.